None in first 5 generations. Korad (passed the Swedish Körung including Mentaltest for dogs over 18 months). Briska's Milla passed the Körung and MH-Mentaltest in Sweden, and is PHTVL/PHPV free. Milla's sire, Pacco von der Weyermühle, passed the ZTP with 1A rating for character and SG for conformation. Her dam, Briska's Ike, passed the MH-Mentaltest in Sweden. Sumo: IPO 2 and passed the Swedish Körung. 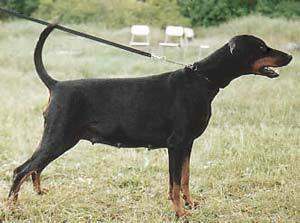 Senta: IPO 3 and winner of Swedish IPO Championship for Dobermanns and passed the Swedish Körung. She is dam of Briska's “Y” litter (Yennie, Yra).